The Short Churchill is beautiful to the look, slightly box pressed covered with a light shiny wrapper. The prelight draw was loose and had Very pleasant nutty, woodsy “cedar” aromas. 1st few puffs of this robusto were blast of pepper and earth and dry cedar with straight medium body and strength smoke, but that didn’t last very long when the smoke settled to and started to mellow. Half an inch down and the smoking experience is very peaceful loaded with pillows of white creamy smoke, lower side of medium with nutty, Cedary flavors and back grounded with touch pepper and sweet orange peel. By the end of this third I found hints of Vanilla, bread and earth with more pepper on the palate, and more body and strength to be straight medium. More Orange, Earth and dry cedar starts off this part of the cigar, while the pepper have faded away and the body still medium but creamy. At the half way point there were few changes where the earthiness became a predominant flavor and some cinnamon joined the smoke, while no change in the strength bring medium. The It is mostly earthy smoke over here, most of the have gone away but the green!!! Earth, hay and touch of bitterness and just a touch of mild coffee with bread like aromas. The body is still medium and creamy with no harshness at all. Well they tasted better than I remember, however they are still not what I can call a complex cigar. The ones I smoked were from a box dated April 2010 so two years haven’t done much for them. Is it bad!! Ok I can’t say it’s bad, but they just doesn’t make it for me because of the Body, strength and flavors. It could be a good intro for newbies though, but a little bit boring for experienced palates. Please let us know your experience about this cigar by leaving your comments. Very nice and accurate review. I bought a box of these when they came out and was very disappointed. I’ve smoked an occasional one since when I swap with friends. To me they’re too mild and lacking in flavor for me to enjoy. I’ve not had a good experience with recent RJ except for a very nice Exhibition #4 I smoked a couple of weeks ago that was full flavored and full of potential. 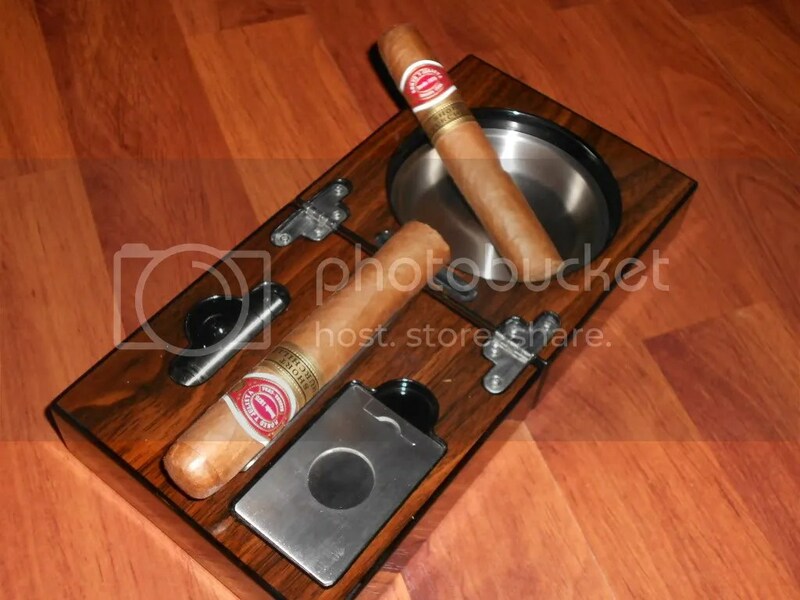 Good review and also, I love that ashtray. It’s very nifty.